Happy Day-After-Thanksgiving, Nom Nom Cat Readers! I hope you were able to partake in a gluttonous quantity of turkey (or chicken, or ham, or lamb) with all the fixin’s, and most importantly, spend quality time with loved ones. And for those who did carve into a whole poultry bird, I certainly hope that you kept the carcass… which brings me to today’s recipe — homemade chicken stock. Martin makes fun of me for it, but one of my favorite Sunday afternoon activities is bringing home a whole bird, butchering it into the assorted parts (breasts, thighs, drumsticks, wings), and making a stock out of the remnants. 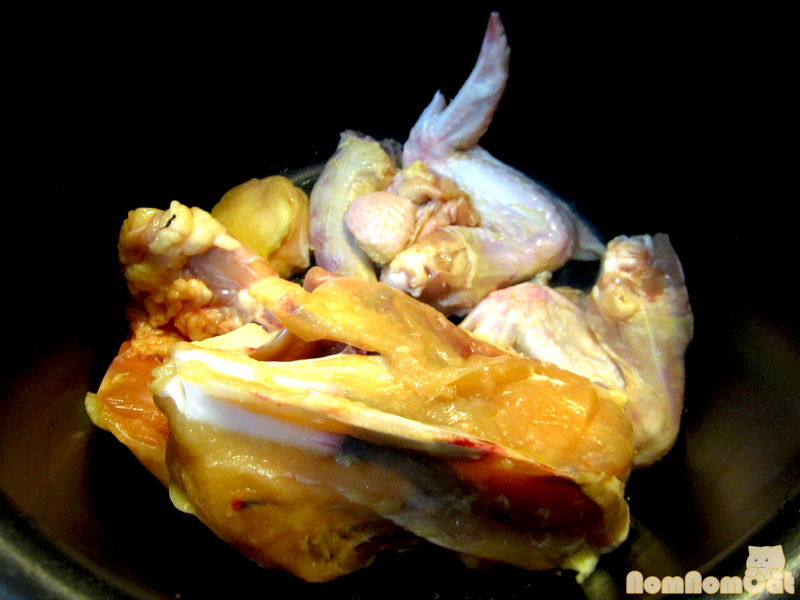 I just use the raw chicken scraps as-is, but roasted chicken bones would impart even more flavor to your broth or stock, so keep that carcass! 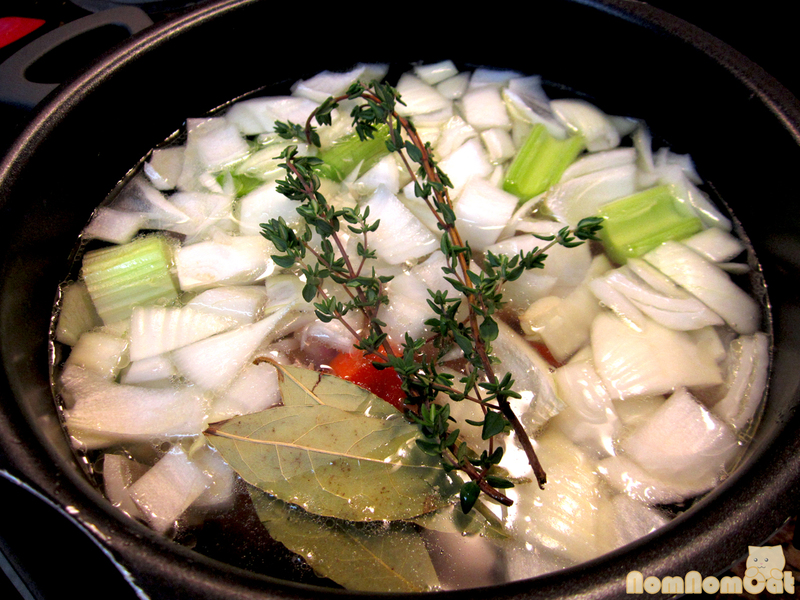 The process is surprisingly simple, and once I used homemade stock in a recipe, I never turned back. Soups, sauces, and especially risotto benefit from a quality base that the canned and carton variety just cannot replicate. Making stock is also a relatively forgiving process. Short on time? You’ll get a nice clear broth. Leave it too long? You’ll end up with a concentrated demiglace that can be diluted later in cooking. But simmer it for just the right amount of time and you’ll yield a rich, full flavored stock that embodies the essence of chicken. 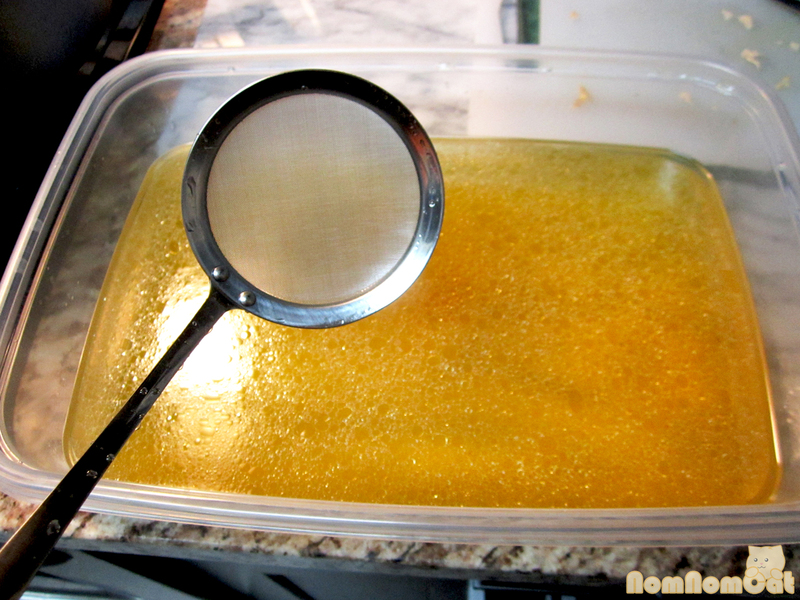 * If having a very clear stock is important for your next recipe, toss in an egg shell and/or egg white. The albumen will attract and trap the “junk” and you can just skim off the floating “raft” at the end. 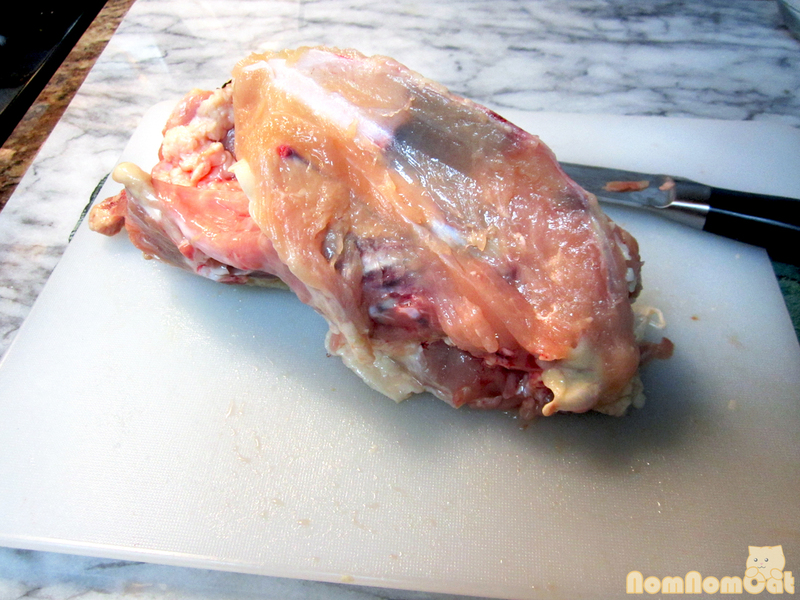 Butcher the raw or roasted chicken carcass. 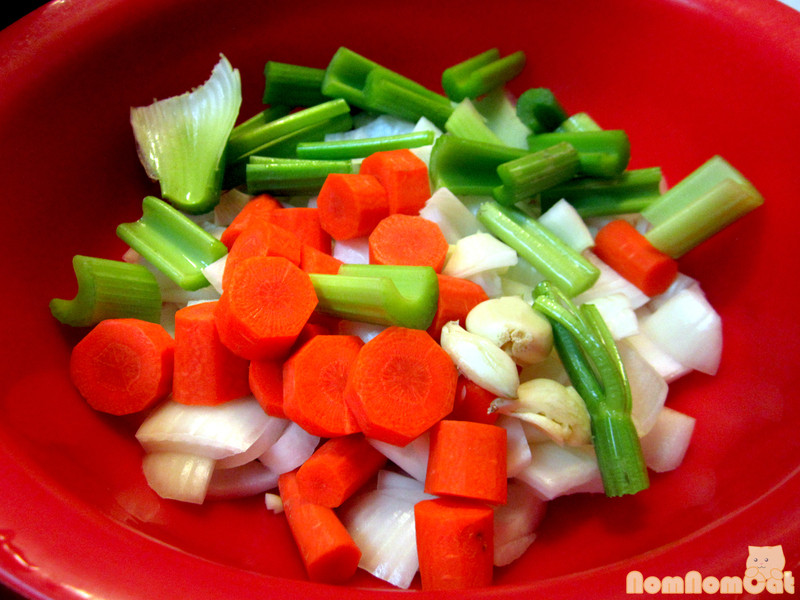 Roughly chop the mirepoix vegetables. The garlic can be left whole – just smash it a bit to release the oils. I like to start my stock by browning the chicken first. The one I bought had a large flap of fat that I had trimmed off, so I started that first to render fat and then tossed in the whole carcass. I also added the neck and two wings. The wings have a great bone to meat to fat ratio for making stock. For a true stock, I do not season the chicken at all. 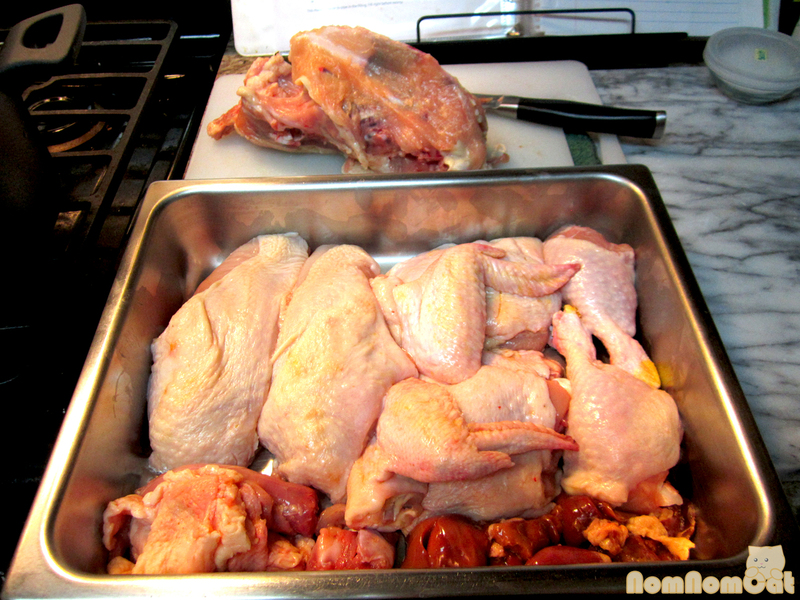 Any seasoning will come from the next stage; the stock only harnesses the chicken flavor. Add the mirepoix. 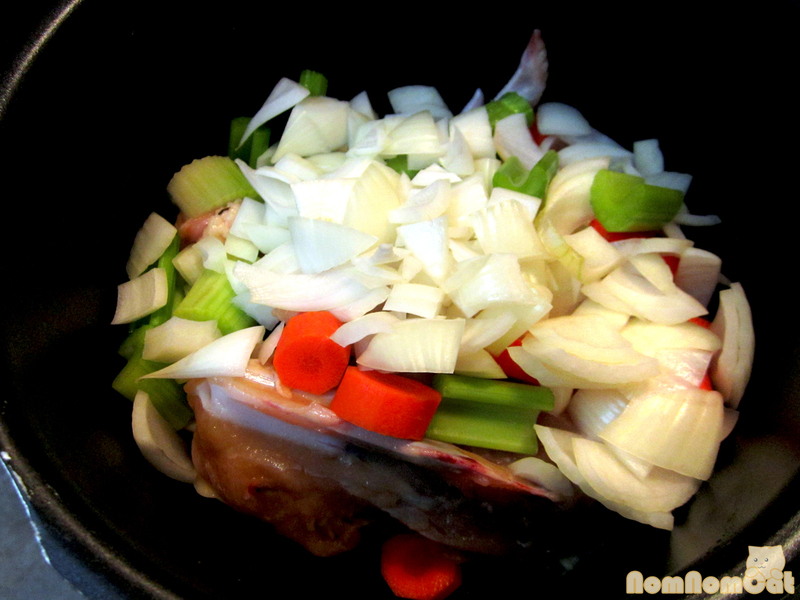 You can also make a chicken stock with only chicken, but I like the flavors that the vegetables add to the final product. Time to pour in the water, cold as starting with cold water will result in a less cloudy broth. Also toss in the aromatics. Bring to boil and simmer for 3 to 4 hours, less for a broth (but at least 1 hour so the chicken cooks through), more for a reduced demiglace. Remove the boiled chicken. After about 4 hours of simmering, the chicken itself will probably be dry and bland. I toss it (there isn’t much meat left on the carcass anyway) but to prevent waste, you can pick the meat off the bones and use for a chicken salad or toss in nuoc cham and eat over rice. 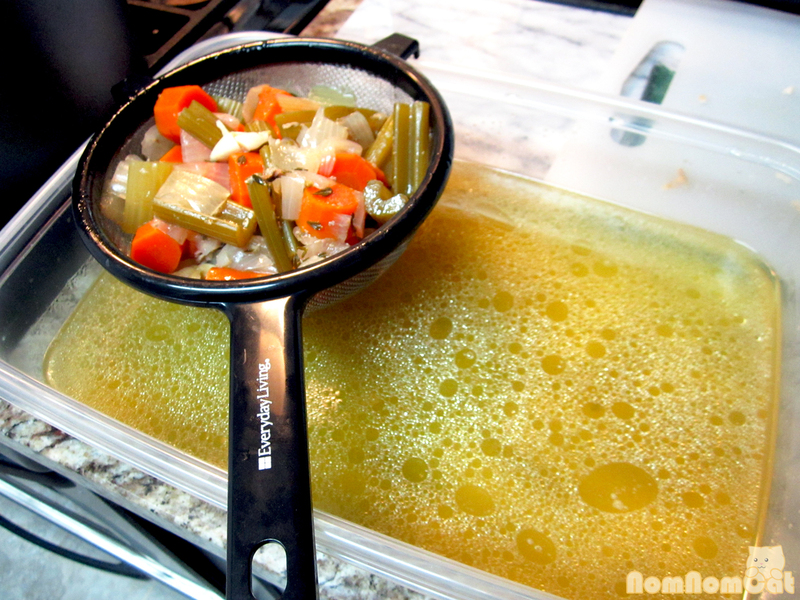 Using a sieve or even a skimmer (in the very first photo), strain out the vegetables and herbs. The recipe should yield about 1.5 to 2 quarts of stock. I stored my latest batch of stock in a freezer safe plastic container, but I wish I had taken the extra step to make my “broth bullion” as Martin likes to call them. 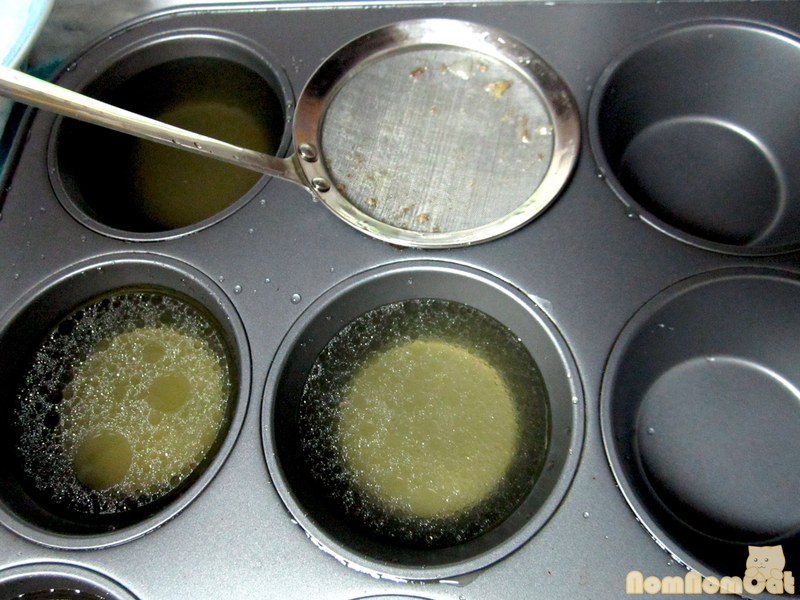 It’s so easy — just strain the broth or stock into a muffin tin, about 2/3 to 3/4 full. Freeze overnight. Once frozen solid, just pop them out (dip the tray in a bit of warm water to loosen if it needs help) and store in a zip top bag. Whenever you need broth, just reheat in a small saucepan. I also love these little discs because they add just the right amount of oomph to my sauces. 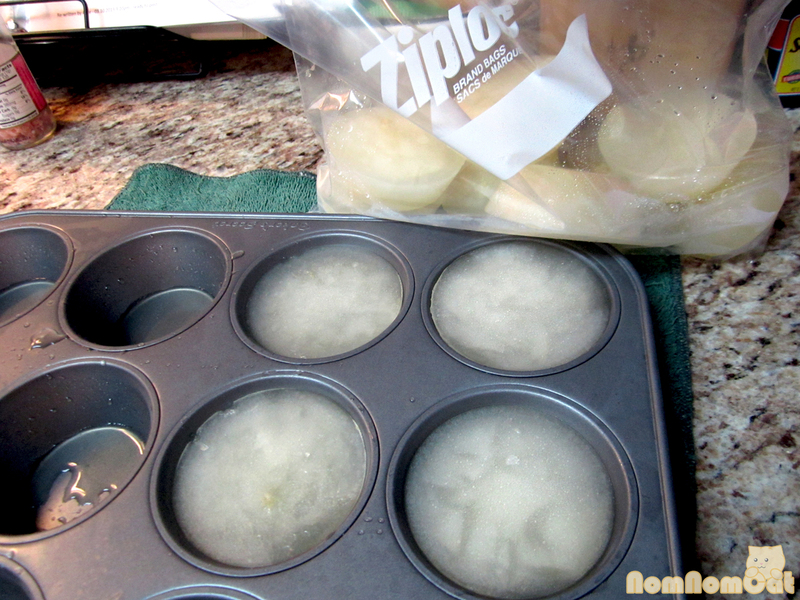 No need to defrost more than you’d use right away, and it’s just as easy as popping open a can of the store-bought stuff. And like I said earlier, nothing beats homemade! 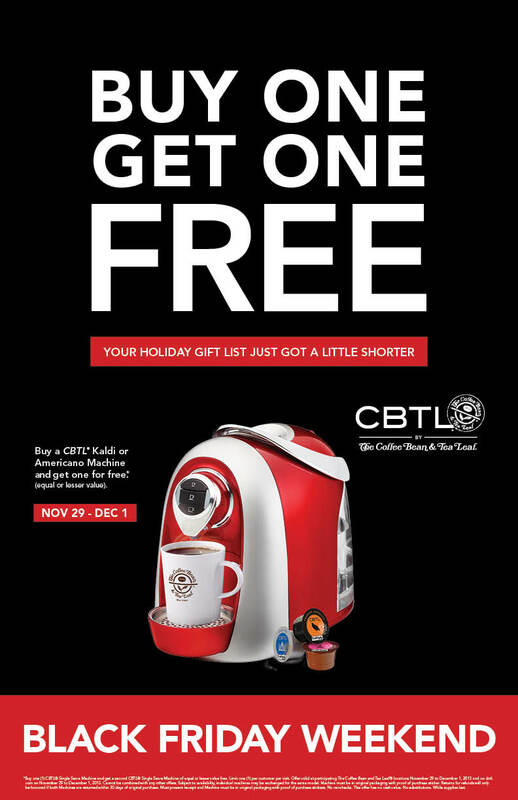 Speaking of Black Friday, a little birdie told us that Coffee Bean & Tea Leaf (CBTL) is participating with a Buy One Get One Free sale all weekend (November 29 through December 1) on their Kaldi and Americano machines. Not willing to brave the crazy crowds at your local mall? Have no fear — this sale is also taking place online with the promo code BOGOCBTL. Check out the website for more info and for the fine print. Enjoy! * Disclosure per FTC regulations: we were not paid for this post but expect to receive a CBTL machine from Coffee Bean & Tea Leaf in the near future to try and review. The views and opinions expressed on this blog are purely those of Nom Nom Cat authors Alice and Martin.